Structure – this is an interference of the muscles, joints, tissues and nervous system interfering with normal function of the body. Electrical Pollution – cell phones, computers, microwaves, and other appliances all are powered by unseen fields which are constantly around us. These can interfere with our body’s own energy fields and cause dis-ease. Nutrition – if our body does not receive the nutrients it needs, it cannot be healthy and this becomes an interference to wellness. This is an area of great specialty and understanding here at Soli. A healthy digestive process is essential to break down the nutrition, absorb it into the blood stream, and then get it into the cells for the building of healthy tissues. If this is not happening, then toxins form and food is not broken down, toxicity and mal-absorption then occur. Allergies and Sensitivities – mal-absorption of foods and ingestion of toxins set the stage for disease, allergies and sensitivities to occur and worsen. This triggers an inflammatory reaction in the body and leads to an increase of allergies and sensitivities causing a vicious cycle of interference to occur. Emotion – emotional stress, according to many experts, causes 80 percent of our physical illnesses. Adrenal stress is epidemic and is a major reason a large portion of our population is addicted to caffeinated drinks of various forms. Toxins – we live in a toxic world. Air pollution, pesticides, insecticides, industrial pollution and heavy metals are found in mothers’ milk in much of the population. These toxins cause free radicals in our bodies and break down the DNA bonds, which cause mutations and cancer. Long before that, however, they rob us of our vitality and energy which are necessary for living and being well. 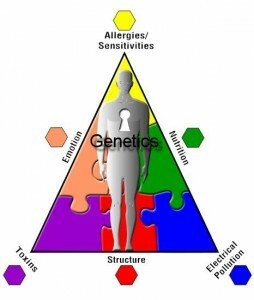 Genetics – our genes are the inherited code by which our cells control all functions in our body. If we inherit defective genes or our genes are not functioning optimally, this interferes with your ability to get well and stay well.